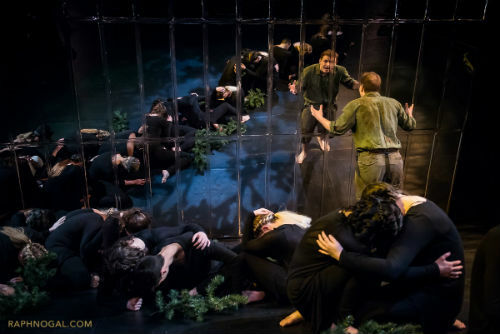 When I was offered the opportunity to review Randolph College for the Performing Arts’ production of Peer Gynt at the Annex Theatre, I was intrigued. I had read and seen other plays by Henrik Ibsen, but not this one. I figured it would be good for my overall theatre knowledge to see it. And I’m glad I did. It’s a fascinating and very well done production. Peer Gynt was originally written by Ibsen, in Danish, in 1876. The plot is based on a Norwegian folktale, and relates the life journey of Peer, a self-centred man, as he adventures from rural Norway to the deserts of northern Africa and back again. Along the way he encounters trolls, seduces multiple women, survives a shipwreck, and even meets the devil himself. There are many different scenes and many different characters. I actually found the story somewhat hard to follow, and not really that interesting. But the ingenuity of the staging and choreography, as well as the strength of the performances by the ensemble cast, were more than enough to keep me engaged. The play moves back and forth between moments of realism and moments of fantasy or dream sequences. The set features an angled wall covered in mirrored panels. Sometimes the actors face the wall rather than the audience, which creates an almost funhouse effect which heightens the unrealistic aspects of the narrative. Andrew Eldridge, as Peer, is on stage for the entire play and has most of the dialogue. It’s quite a responsibility, and Eldridge is up to the task. He plays Peer as arrogant and narcissistic, but with a real sense of fun and adventure. Almost all of the other actors play multiple roles. But rather than being individual characters with specific names or qualities, most of the time they work together as an ensemble. For me, director Richard Rose’s use of the ensemble was the most interesting part of the performance. The actors are wearing all black. With simple props such as hats, masks, and pine boughs, they are transformed into a crowd at a wedding, or the trees in the forest, or the ocean. Each individual is a piece of a bigger community or phenomenon that confronts Peer and challenges him. Although Peer Gynt is definitely not musical theatre, movement and song are key elements of this production. I thought the choreography was a real highlight. The actual dance sequences, the way the performers used their bodies to represent things and ideas, and the way the actors flowed from one scene to the next all conveyed meaning. Overall, I was very impressed by the Randolph College students. Peer Gynt is a challenging play and they did a great job with it. If you’re interested in a classic of early modern theatre, read a plot summary beforehand and definitely check it out.